Markus Howard has had quite the season. 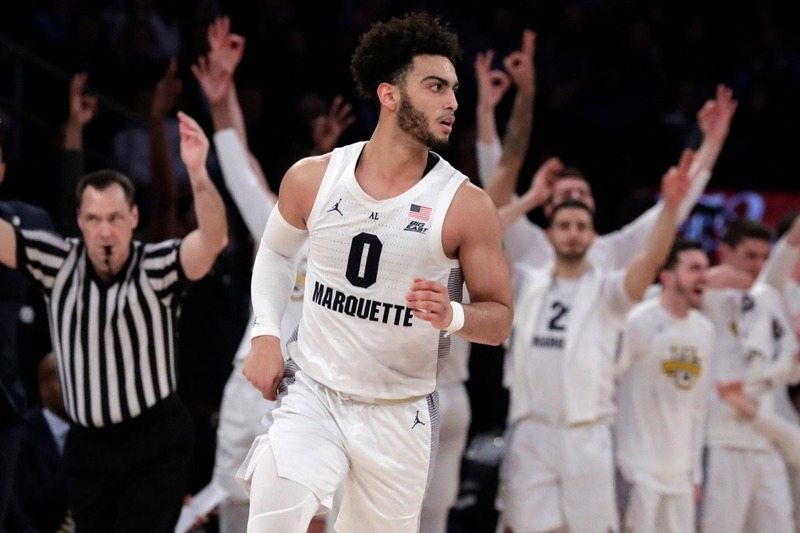 The junior guard is averaging 25.0 points, 4.0 assists and 4.0 rebounds per game, all career highs, while leading his Marquette Golden Eagles to a 24-9 record and a No. 5 seed in the NCAA Tournament. Howard’s scoring average this year is good for sixth best in Division I and first among power-conference players. Only 5 feet, 11 inches tall and 175 pounds, he’s often able to create enough space on the perimeter to hit deep threes. He’s shooting 40.8 percent from long range this season while making 3.5 triples per game. Howard scored 45 points in a game on two occasions this season, but his career-high came in a game at Creighton on Jan. 9, when he recorded 53 points and 10 3-pointers in the overtime win. When Howard, who has worn No. 0 since he arrived on Marquette’s campus, takes over a game, it can seem like he is everything for his team. Yet he knows he is nothing unless God is in him. Between Howard’s sophomore and junior seasons at Marquette, he made the decision to go on a missions trip to Costa Rica. The work was grueling, but Howard was inspired. Upon his return, he helped to start the first FCA (Fellowship of Christian Athletes) chapter on campus. Sometimes during a game, Howard can be seen pointing skyward as a reminder that God is in total control and that God deserves all the glory. A tattoo of Philippians 4:13 on Howard’s wrist serves as another reminder of God’s steadfast love. Secure in his identity in Christ and in the knowledge that God gave him astounding abilities with a basketball, Howard will now showcase those talents on the sport’s biggest stage: the NCAA Tournament. He’ll lead Marquette into its opening-round game against No. 12 seed Murray State and superstar guard Ja Morant, also among the top 10 scorers in Division I men’s basketball this season. The game is Thursday at 4:30 p.m ET in Hartford, Conn.